The past week has been icy and cold, rainy and wintery. Completely abnormal for Austin. But it made me think of places where cold is normal, and snow comes every year, and fireplaces are lit with the smoky aroma of pinon wood…it made me think of New Mexico. Invariably, when I think about New Mexico, I think about food. Roasted green chiles and thick sopaipillas, red enchiladas and roasted pinon nuts. I decided to throw together some cookies that tasted a little like New Mexico, with toasted pine nuts and a bit of cinnamon, plus dried cherries for good measure. 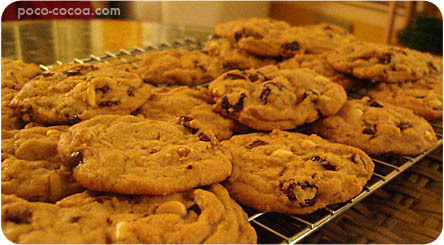 It’s just a spinoff of my favorite chocolate chip cookie recipe, but it’s yummy nonetheless. Beat butter and sugars together until creamy; add egg, yolk, and vanilla and beat well. Add flour, baking soda, salt, and cinnamon; beat until thoroughly mixed. Stir in chocolate chunks, cherries, and pine nuts. Drop onto cookie sheets lined with Silpats or parchment paper and bake 14 to 16 minutes, rotating halfway through, until just set on top. oooh, i love new mexico and cookies so this looks like a perfect recipe. Yum. These are so inventive and tasty looking! Cherries, pinenuts, and chocolate in a cookie! Hmm, sounds interesting. I will definitely have to give them a try. I live in NM, so I don’t really miss it but your cookies look so good I’m going to give them a try! When I miss a place I think of food too.